F.W.Sturge was born in about 1858 in Gloucester. He generally painted in watercolours and after training at the Slade exhibited from 1878 to 1908 (for example at the Glasgow Institute of Fine Arts, the Ridley Art Club and in Birmingham). He lived in Cornwall and Gloucester at different times. 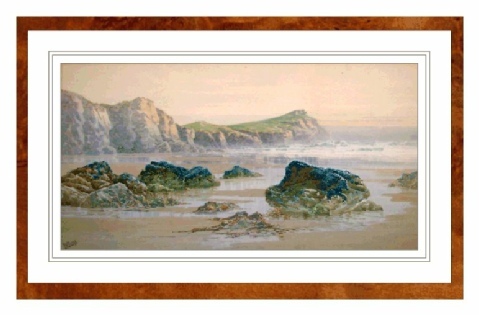 Many of his landscapes and coastal scenes were done in Cornwall and the Channel Islands as in the example above, although he also exhibited some Egyptian scenes at the end of his career (possibly done on his way to India as there is a known picture by him of a scene near Quetta). His full name was Frederic William Sturge, but he preferred to use the name William apparently (he was an officer in an army Terratorial regiment in India in the first World War and was known locally in Cornwall as "Major Bill") . He sold some scenes done in India on his return home. He came from a well known west country family and was related to Joseph Sturge (1793-1859), a philanthropist and slavery abolition campaigner, and William Allen Sturge (1850-1919), a physcian. The artist was the son of Edwin Sturge - he married Charlotte Gryles (from a Cornish family), although no offspring of this marriage are known, and finally settled in Tintagel on his return from India. He died in about 1939. Sturge apparently visited or lived in Clovelly for a while and is mentioned in a booklet entitled "Clovelly: A Guide Book by Angela Ruthven published in 1926. To quote "Mr F.W.Sturge, in his delightful collection of studies made at Clovelly, shows very conclusively that a painter may make excellent use of his time who comes here for a month or so". The book also has a reproduction of a painting by him on page 44. Apparently there were at couple of his paintings hanging in the Red Lion Inn in Clovelly some years ago. 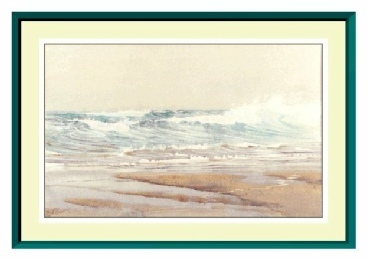 The pictures above are good examples of how in watercolour a few graduated brush strokes can simulate the appearance of water washing over sand in a way that could not be easily done in any other medium. White body colour is used to highlight the tips of the waves in the second example. The first picture above was contributed by Martin Mallin.